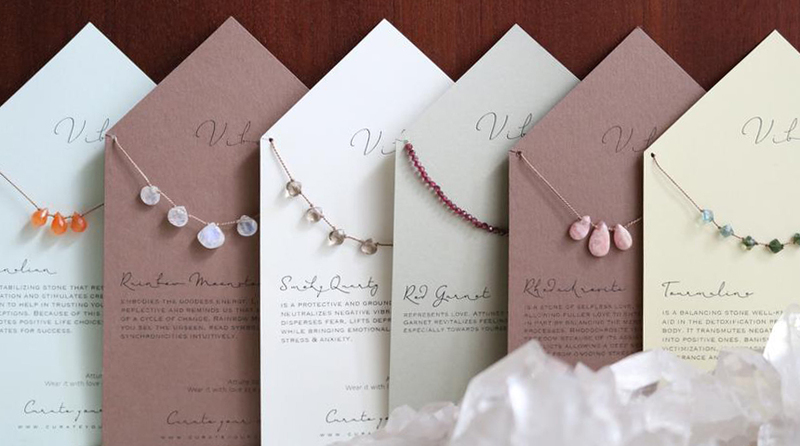 "Necklaces Intended to Nurture You with Nature." Carefully Curated, Pause-Worthy Gemstone Pendants. Most of us choose jewelry and accessories based on how they make us feel about how we look. It's the chance to express your personality, include a pop of color, tie together an outfit, wear something sentimental or symbolic. But what if your jewelry could do more for you? Austin based jewelry designer Elizabeth Crandall is a big believer in creating accessories with extra benefits beyond just looking good, and that's why she came up with Vibe, a collection of gemstone necklaces "intended to nurture." At the most basic level, these simple pendants on silk thread are designed to help the wearer slow down and appreciate the little things, leading to more positive vibes in the bigger picture. I personally love the idea of wearing something with that kind of power. Whether or not you ascribe to the different healing qualities of gemstones, I think we can all agree on what a beautiful little reminder such a necklace would be to give ourselves a little more grace. Every time you see the necklace around your neck in the mirror or touch the stone, you get that nudge to think about the positives. Elisabeth offers a wide array of choices from the color to cut to number of stones on each necklace. I love that you get some insights about the stones you choose right on the packaging for these necklaces in case that's meaningful to you. I'm very impressed with that level of care and expertise when it comes to picking stones. When an artist loves what they do, the passion really shows. 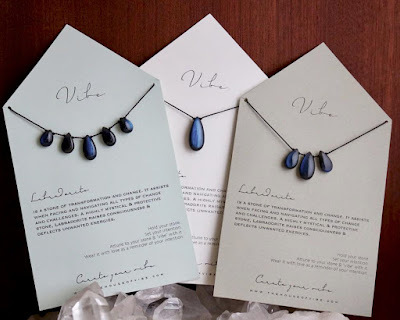 For Elizabeth, her Vibe necklaces are like a gift she's giving each of us. What beautiful inspiration to go along with really pretty jewelry. Simple, elegant, as unique as each wearer!